we still search miners for our pool, we havent any recommendation of plot size or limit of deadlines. 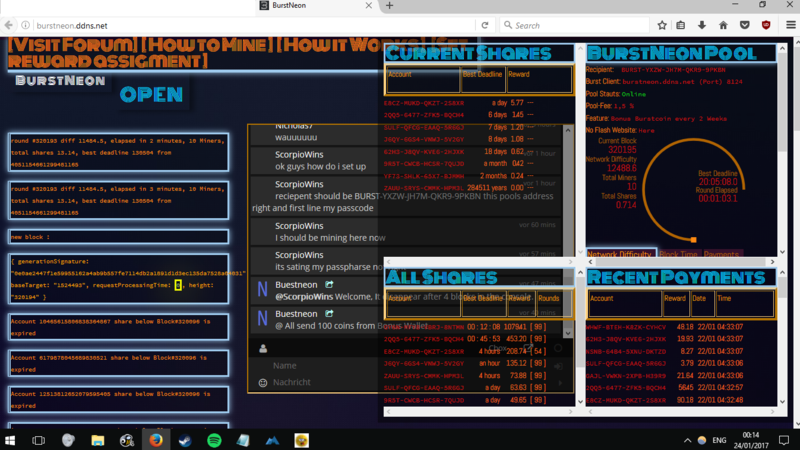 If you wanna join us (select/paste burstneon.ddns.net in the Burst Client) . updated pool code and website, for other quest write pm. thanks, hope you can add the pool in the burst client with next update. Still search some more miners, all sizes are welcome. Hey, I'll probably join your pool, I like switching around now and then. @TalkingCat Thank you, we working on it to restructure the site. You can zoom out in firefox it fix it most cases. @ZapbuzZ thats nice to hear that, you are welcome. Server up again, best regards. Looking Forward for more miners, mine with us ! Hey. I joined the pool, I will give it a try.